« last night a very pretty girl came over to my house. newsweek interviewed paul and the results are predictable and softballish in nature and allows mr westerberg off the hook at every chance. no wonder bush is still in office. Newsweek: Is there a magic [dollar] number that would get you guys on the road again? Westerberg: Well, that would be the magic question. No, it’s more the willingness. I don’t know what it would take for us to actually rehearse these old songs … Also, in the course of the last six years I’ve gone from being completely sober to one inch from death to completely sober again. Right now I’m very healthy, but I know secretly, in the back of my mind, that when you go on tour, that’s when you tend to weaken when it comes to whatever vices you might have. I know Tommy’s aware of that, too. So a little part of the reunion thing is us being afraid of getting back together and falling into our old ways and not making it home. Newsweek: You and your wife have a son now. 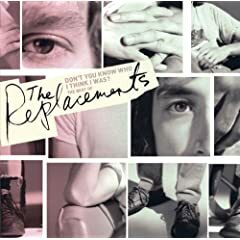 Westerberg: Yeah, Johnny. He’ll be 8 in a couple days. I coach his baseball team. We played last night, and the third baseman from the other team said they’d lost their last game by 43 to nothing. So I started stopping our guys on third base and holding ’em up, but we murdered them anyway. sorry, not softballish, little leagueish.